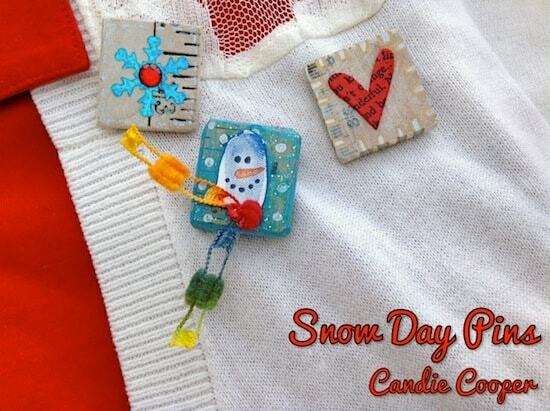 These snow pins are EASY and fun winter crafts for kids! 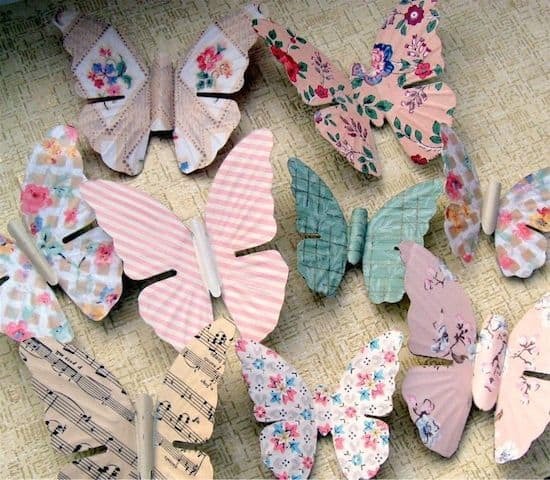 Make them with simple supplies; they are great for holiday and Christmas gifts. Hi there! I'm Candie Cooper and so excited to be guest posting for Amy's MPR blog. 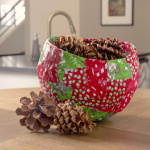 My specialty is jewelry making – but I also love holiday and winter crafts for kids. 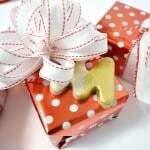 With Christmas coming, you might be thinking about gifts for teachers, neighbors, postal workers, etc. I've got a quick project that you can make with your kids every inch of the way. 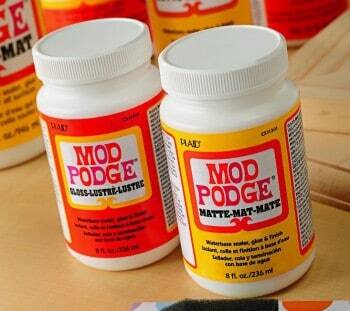 For this project I used the magic potion that this entire blog is about: Mod Podge! 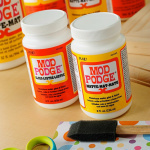 This project uses a very special formula – Sparkle Mod Podge. 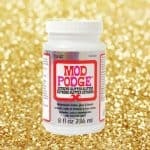 Everyone loves a little glitter, and Sparkle Mod Podge adds a subtle glitter touch to your project. Of course you can layer it up and add a ton of glitter if you like – that's up to you! 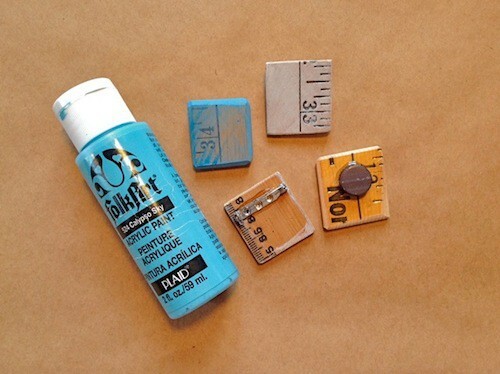 In addition you'll need a ruler (cut into pieces), acrylic paint, pins or magnets for the back, glue, scissors, a Sharpie, paintbrushes and various embellishments to decorate your pins (described below). Place some white paint on a paper plate. 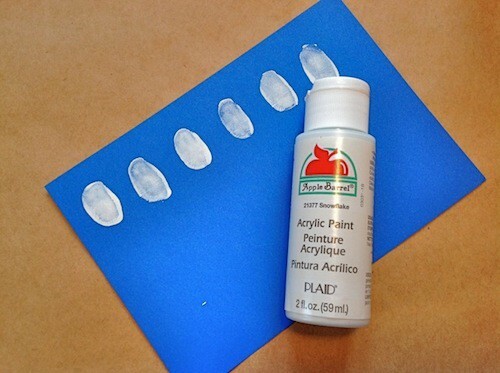 Make fingerprints on blue card stock and leave to dry. Cut around the prints. Slice a yardstick into 1.25 inch sections. Sand around the edges with a nail file or sandpaper to smooth. Optionally, you can paint the yardsticks (I used water with my paint to make a stain). Glue a magnet or pin back onto the back. Mod Podge various embellishments onto the front – buttons, snowflake sequins, chipboard hearts, flat back crystals, words are a few ideas. For the snowman, I used permanent markers to draw a face and decorated the yardstick piece with silver polka dots. 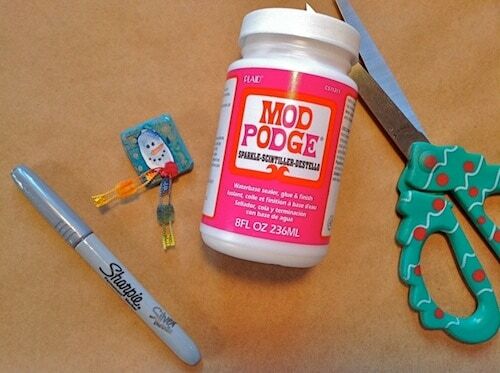 Add a little glitz around the snowman's face with Mod Podge sparkle. Hot glue a tiny piece of yarn for a scarf. 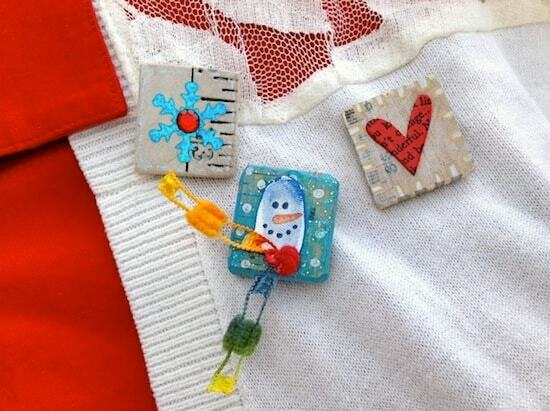 Wear your finished pins with pride all winter long – or give them as gifts! 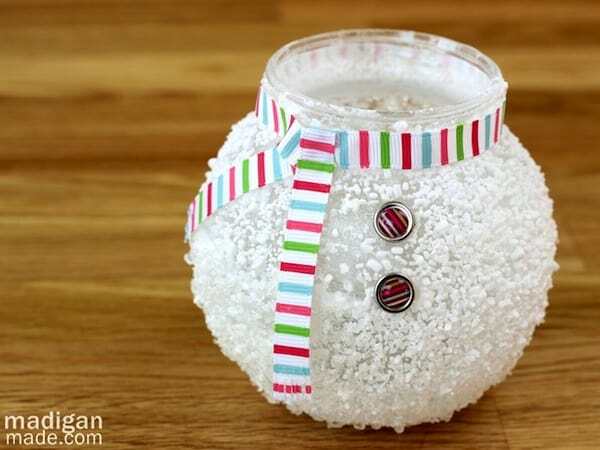 If you like winter crafts for kids, check out this snowman epsom salt votive. Kids and parents can make it together (SO easy)! I like your DIY snow pin idea. They are simple and rustic making them appropriate for this time of year.